Maple Leaf Gardens is an iconic building that changed the culture of sport in Canada. In 1927, Conn Smythe purchased the Toronto St. Pats hockey team and renamed it the Maple Leafs. Construction of a state-of-the-art home venue for the team began in June 1931, with workers getting 20 per cent of their wages in shares of Maple Leaf Gardens Limited. The building was completed in less than six months and became the largest arena in the country, with seating for 13,000 spectators. The Gardens also served as an indoor venue for important cultural, political and religious events, including: Elvis Presley and Beatles concerts, Winston Churchill’s 1932 British Empire speech, and Prime Minister Pierre Trudeau’s 1979 election rally. It also saw a variety of sporting events, such as boxing matches, figure skating and basketball. The building was designated under the Ontario Heritage Act in 1991 and became a National Historic Site in 2007. The Maple Leaf Gardens was extensively renovated by its current owner, Ryerson University, in 2010. Visit the Mattamy Centre (formerly Maple Leaf Gardens) at 50 Carlton Street in Toronto, Ontario. 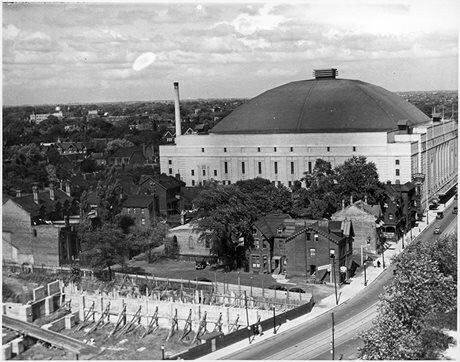 Learn more about the history of the Maple Leaf Gardens from the Heritage Toronto website. Watch Historica Canada’s Heritage Minutes video on the Maple Leaf Gardens. See inside the Maple Leaf Gardens from a report done by the CBC on April 12, 1991.